It's day two of my blog anniversary giveaways and today's prize is absolutely stunning - a beautiful tutu skirt from Angel's Face. The lucky winner will be able to choose a tutu skirt in their choice of style and colour and there are so many beautiful options to choose from. 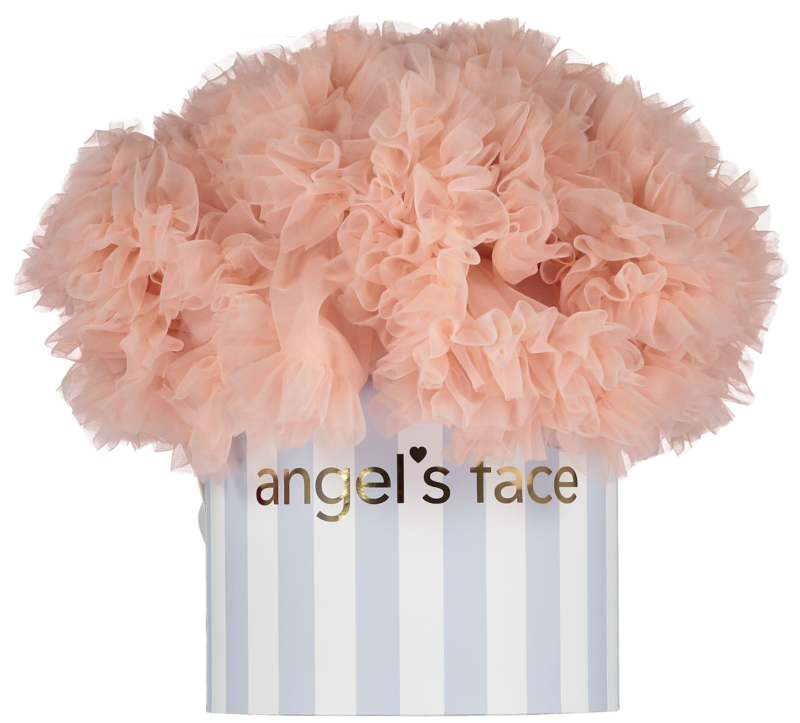 Angel's Face is the creation of Keely Deininger, who began producing on beautiful product exceptionally well - an iconic tutu delivered in a vintage-inspired hat box. To date Angel's Face have sold over 200,000 tutus and the brand has expanded it's range to include tops, leggings, dresses, hair accessories, shoes, etc. The collections are designed with something a little bit special in mind and with embellishments such as satin trims, sparkly collars and gold charms, each piece has something extra special to make girls covet, adore it and make the best memories wearing it. I imagine if I'm ever lucky enough to have a daughter, that I would dress her in the beautiful pieces that Angel's Face has to offer. This is such a wonderful prize for anyone who has a little girl in their life and the winner gets to chose the style and colour of their Trinity tutu skirt. This is a prize worth £56! To be in with a chance of winning simply enter via the Gleam widget below. Please read the terms and conditions before entering. Best of luck to all who enter! 1. This giveaway is open to residents of Ireland the U.K. only. 2. The giveaway will run for two weeks, beginning on 02/03/2018 and ending on 16/03/2018. 4. The prize is being sent directly by Angel's Face, so by entering, you are giving your permission for your details to be sent on to the person sending your prize. The jade green tutu seems made for my girl!! Hope to get it! I'd choose the Pastel Posy Tutu, So pretty! I'd probably pick the Ash Grey. I absolutely love the tea rose tutu it is stunning! I am in love with the charming trinity tutu in ash grey, it is just to die for! I would choose the Charming Trinity Tutu Denim Blue. Charming Trinity Tutu Rose Pink please - they are gorgeous, thanks for the chance to win! The charming trinity in rose pink is stunning! These are so beautiful, I know my daughter would love one in purple! I would choose Frozen Aqua colour. I love the Charming Trinity Tutu Vintage Rose. so cute! Charming Trinity Tutu Denim Blue - very girly but not overly so! Oh my goodness, how I would of loved one of these as a child, but I know my granddaughter would just love the Charming Trinity Tutu Lucky Green. My Granddaughter would love the rose pink tutu. She would be my little Angel Face. I would choose the Charming Trinity Tutu Rose Pink. I'd love to win the Charming Trinity Tutu Vintage Rose for my youngest daughter. I'd love the Tea Rose Tutu for my daughter! All of the tutus look so stunning. But, my favourite is the Tea Rose Tutu. I'd love to win this for my daughter Aliyah. I love the charming trinity tutu in black. I would choose the blush Tutu it's absolutely beautiful. Tough choice! There are some beautiful pinks but I'm going for the Charming Trinity Tutu Lucky Green! I like the Emerald Green Tutu. I would choose Charming Trinity Tutu Rose Pink but they are all so lovely! Charming Trinity Tutu in blush for my granddaughter! the Blooming Lovely Tutu looks pretty. I would choose the Charming Trinity Tutu in Fuschia Pink - my daughter would adore this!! Charming Trinity Tutu Fuchsia Pink looks wonderful. It will be for my daughter. My daughters favourite is Charming Trinity Tutu Azalea Pink, which I think is beautiful as well. the emerald green tutu is gorgeous! I am drawn to dove grey for the girls so would go for the Charming Trinity Tutu Ash Grey. I love the pastel posy tutu .... so pretty! I adore the Charming Trinity Tutu Vintage Rose. The Tea Rose one is beautiful! I would choose the Charming Trinity Tutu Sweet Violet. Charming Trinity Tutu Rose Pink is gorgeous! I would choose the Charming Trinity Tutu Rose Pink it is so lovely & very pretty! Charming Trinity Tut in pink! I love the Charming Trinity Tutu Rose Pink. It has to be the rose pink. It's absolutely gorgeous and my daughter would love wearing it at every opportunity! I think I would choose the Charming Trinity Tutu Ash Grey. I really love the Tea Rose tutu - that vintagey colour is lovely! Charming Trinity Tutu Frozen Aqua is so pretty. Thanks for the chance. I would choose the Blooming lovely tutu, but they are all so pretty. Charming Trinity Tutu Ash Grey but they are all stunning!